My wife borrowed my Nikon D-50 and SB-600 flash the other day. When she returned home I noticed as piece was missing off of it. When I inquired about it she remembered that she had accidentally dropped the flash because it wasn’t locked to the camera. Further inspection showed that the flash seemed to operate normally but wouldn’t produce the bright flash that it is supposed to. (An important part I know.) I tore into it and discovered that the flash bulb was broken. 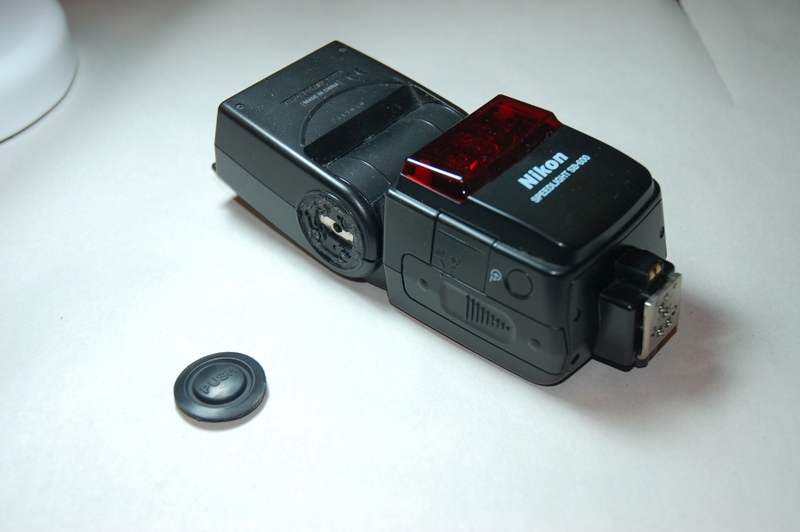 After searching around on the internet I found that I could send it to Nikon to be repaired for what would probably be a $160+ cost or order a bulb for $15 and replace it myself. I’m sure you can guess what I chose. 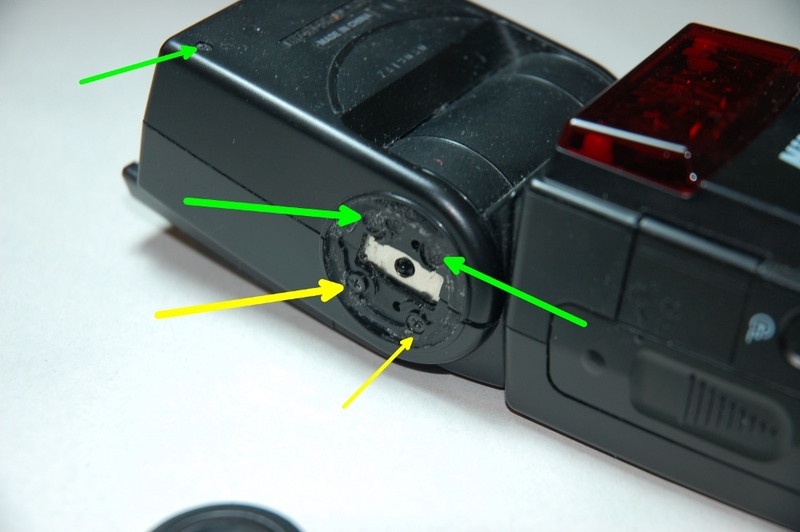 Here’s a step by step guide on how to replace the flash bulb. 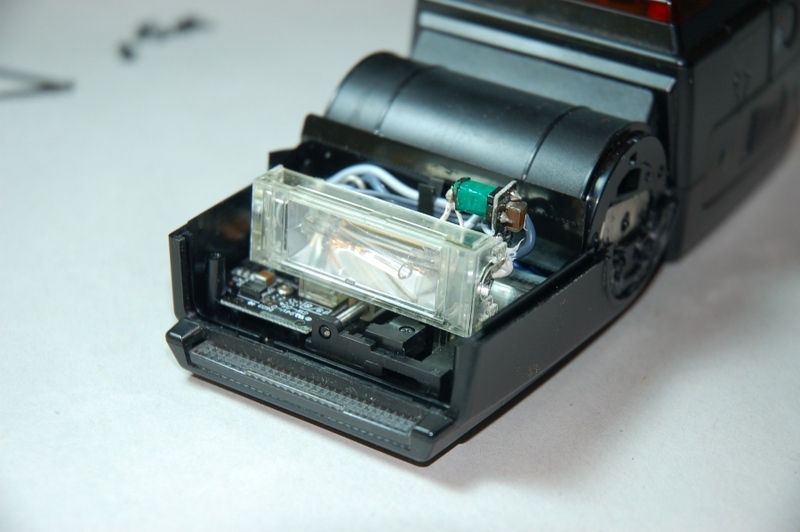 You’ll need to have batteries on hand to power the moving flash bulb assembly. You’ll also need a soldering iron, solder, solder sucker (or wick), small screwdrivers, and of course a replacement bulb. You’ll also need basic soldering skills which I don’t cover here. I might cover them in a later post. If needed let me know. The batteries in the flash charge a capacitor that discharges to fire the flash. So, even if you remove the batteries the capacitor will be charged and there is a chance that you’ll get shocked working on the flash. Just think of it as the flash reaching out and to say “Hello!” If you don’t like getting shocked wear gloves or let someone else work on your flash. In this sue happy world that we live in, I strongly suggest that you don’t work on your flash and if you do, and get zapped, it is not my fault. 1. Pry the rubber pads off of the sides where the flash head rotates. There is one on each side. I’ve pried one off in the picture below. They’re stuck on with some kind of rubber cement (well closer to weather stripping adhesive but that is a little less general) style adhesive. Pry around the edges with a small flat blade screwdriver. Once you get an edge up you can pull it off with your fingers. 2. Once you get both rubber pads off you’ll see four small Phillip’s head screws. On the side with “Push” pad ( pictured below) you can easily see the four screws. On the other side you may have to hunt around with the screwdriver tip to find them as they may be covered by an adhesive pad. Of the 4 screws per side, remove the ones with the green arrows. You can remove the yellow arrowed screws but you don’t have to. On the bottom of the flash head there are two addition screws to remove to separate the halves to the flash head. 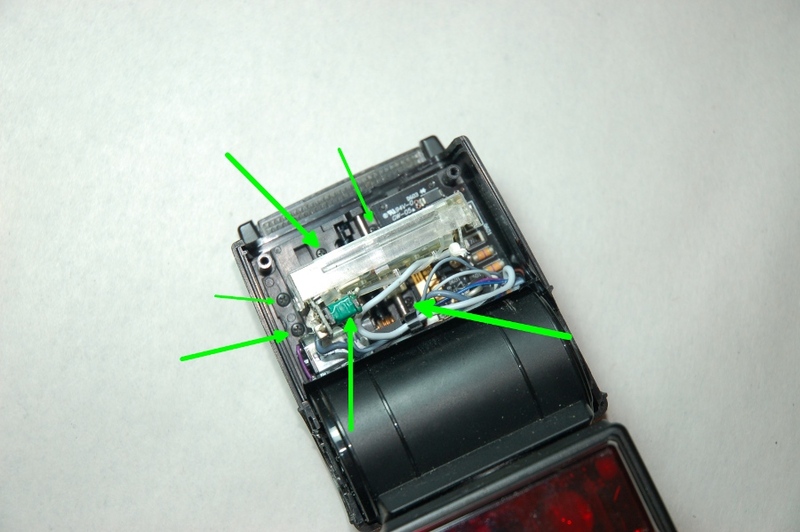 One of these screws is pointed out with the upper green arrow. You should now be able to separate the flash head halves. The adhesive pad on the other side may not let the halves separate. If so follow the seam down and cut the pad with a knife. 3. Once the halves are separated, the Fresnel lens (clearish plastic piece on top of the flash head) can be removed. Note that it is keyed for when you put it back in place. As you can see my flash bulb is broken. 4. With the halves separated there are six screws that need to be removed. This flash moves the bulb depending on the zoom of the lens. You can manually move the bulb with the controls on the back by pressing the Mode button to display a “M” and pressing Zoom. Move the bulb to the top and remove the bottom two screws. Move the bulb to the bottom and remove the top two screws. Finally remove the two left screws. Note that the two screws on the left are bigger than the others. Once you’ve done this the bulb assembly can be removed from the case though it’ll still be tethered by wires. 5. There are three places that need to be desoldered to replace the bulb. Two are at the ends of the bulbs and one is on the end of the green box in the picture below. 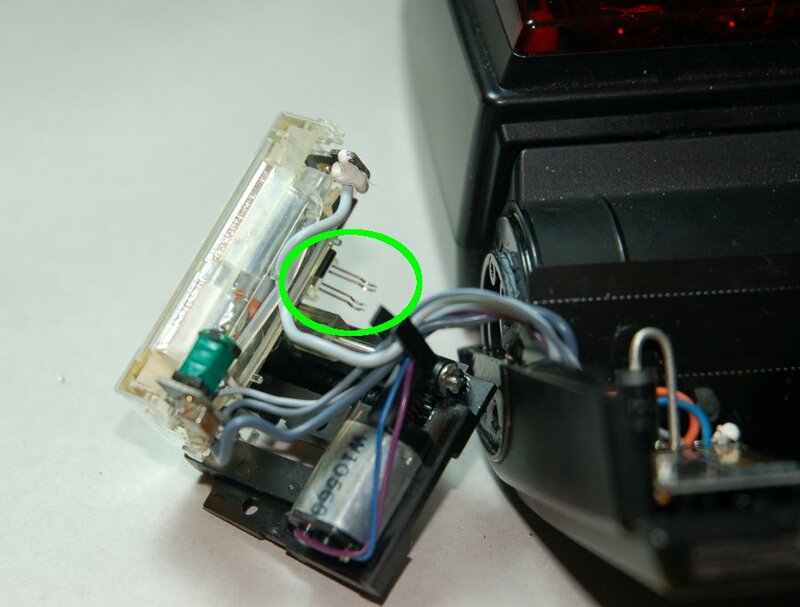 First remove the solder from the end of the bulb pointed out by the green arrow. 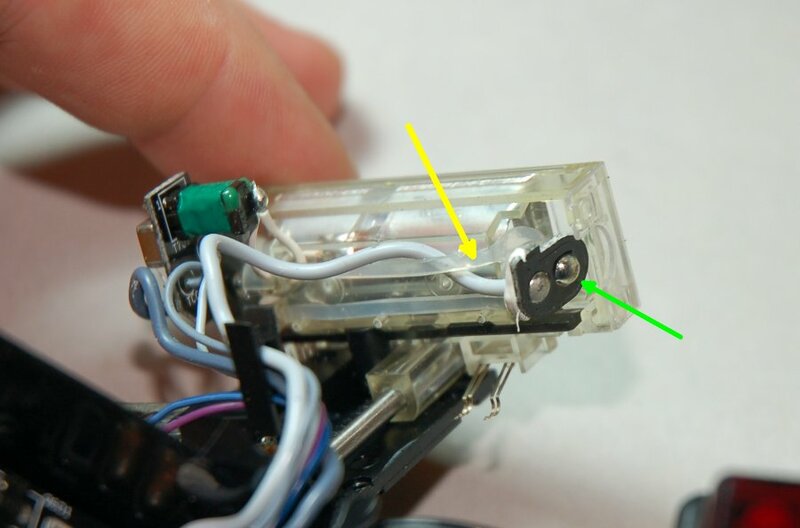 There is a rubber band (yellow arrow) that holds the bulb in place. Note how it is oriented so that it can go back in the same place/direction and that it holds a gray wire under it. 6. 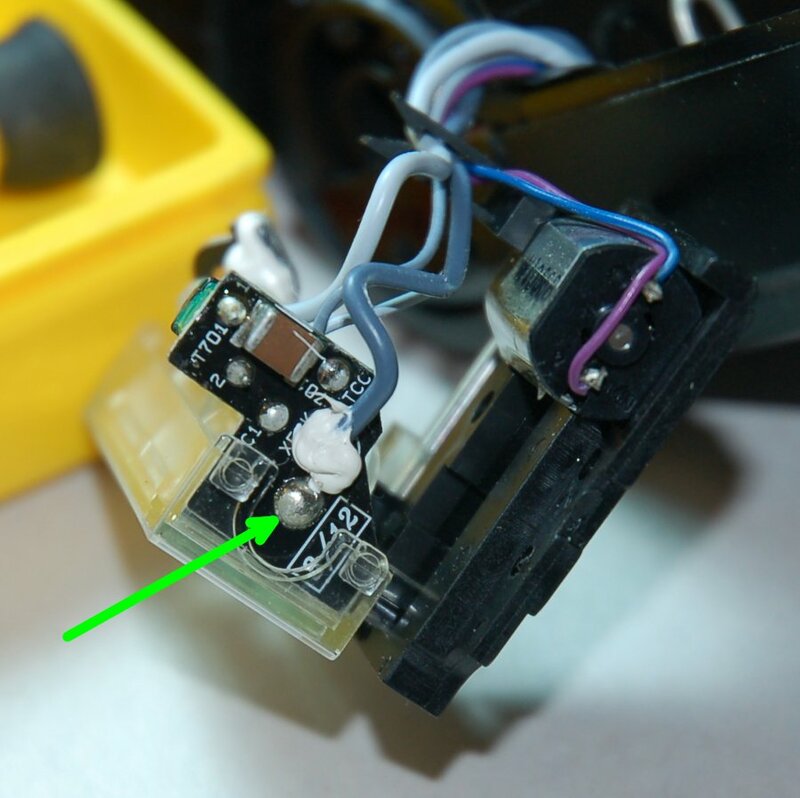 On the other side of the bulb is the other spot that needs to be desoldered (green arrow again). Remove as much solder as you can to free the bulb pins. 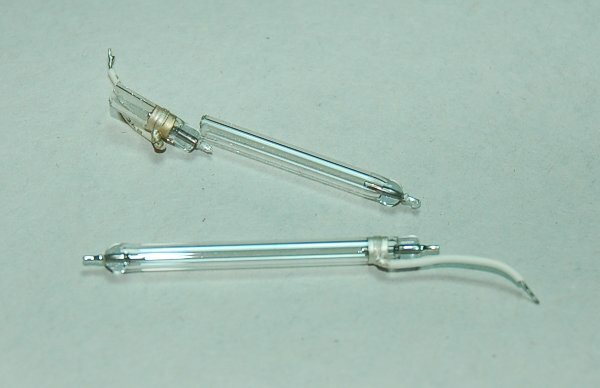 Since the bulb is broken you “may” be able to carefully remove the two pieces of the broken bulb. This may make desoldering easier. Once you’ve freed the broken bulb pieces from the boards they’re soldered to, go back to boards and remove any additional solder that you can. You want the pins on the new bulb to slide through the holes easily! 7. 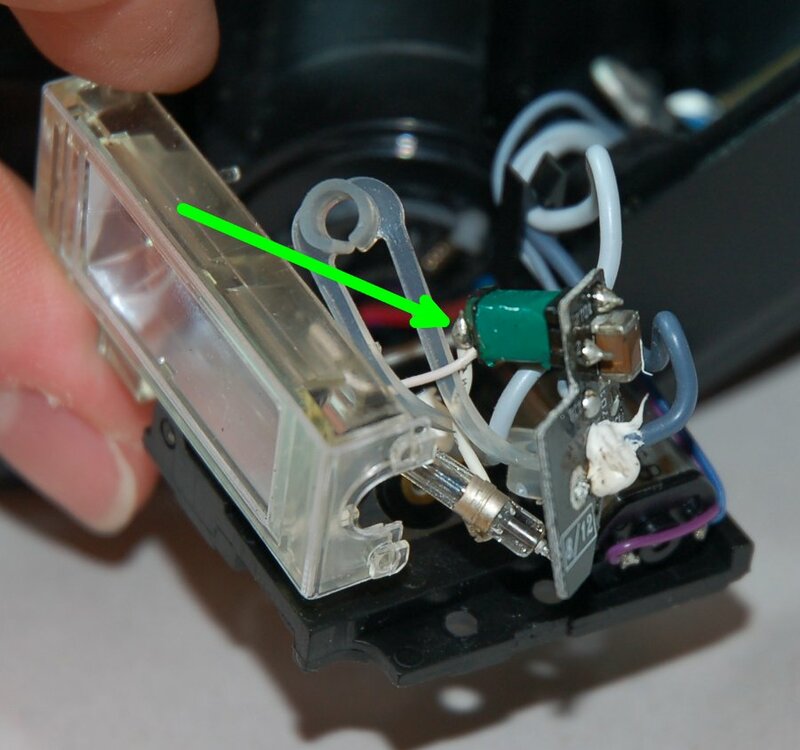 There is a metal ring on the bulb with a white wire leading off of it that attaches to the end of the green and black box. There is a thinner wire that goes from this solder point to somewhere else. 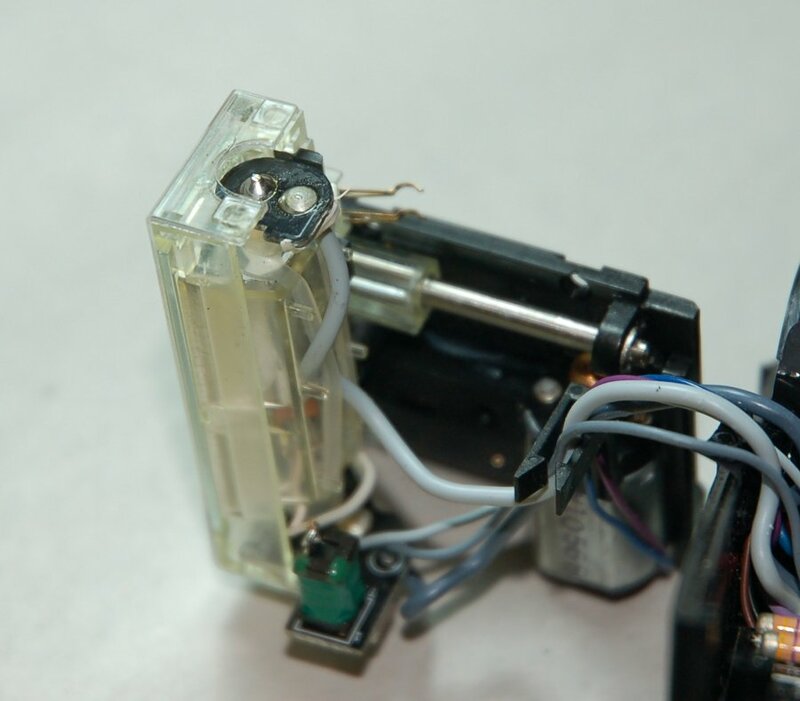 When you desolder the bulb wire, the thinner white wire will probably come off as well. Make sure it gets reattached! 8. Noting the direction, slide the new bulb in to the plastic enclosure. Next, put the rubber band back on making sure to put the gray wire under one side. Now the hard part. You need to slide the bulb in one direction and place the board over the end of the bulb so that the pin pokes through the hole. Then slide the bulb in the other direction and put the other board on the end of the bulb. This is the longest step of the process. Go slow and be patient. Don’t use a lot of force. If it feels like the board is binding stop and try another approach. In the green circle is something I should have pointed out earlier. These copper fingers help move the blub assembly around. Be very careful with them as they’re fragile. If they get bent, gently move them back into position. 9. Now solder the three spots that were desoldered earlier. Double check all the connections and make sure everything looks like it did before. Once this is done you can power on the flash and test fire it to make sure everything is working well. If you’re not dazzled, proceed to the next step. 10. Put the bulb assembly back in place and install the screws. 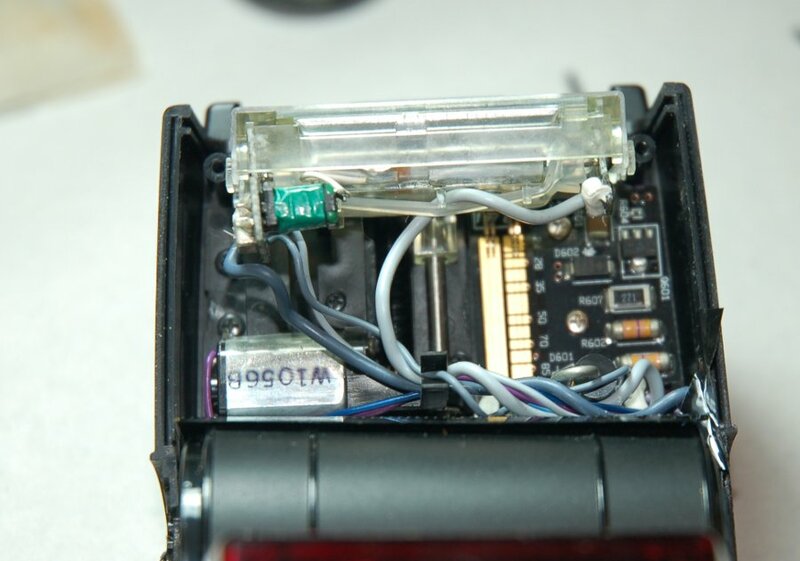 As before, you’ll have to move the assembly around using the controls on the back of the flash to get clearance to some of the holes. 11. Put the lens back in place and close up the flash head halves. Next, reinstall all the screws you removed before. 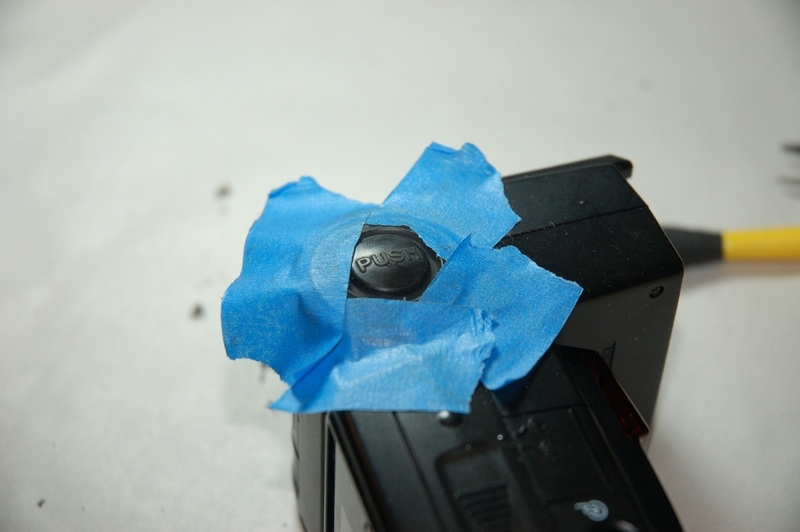 If there is still adhesive on the backs of the rubber pads you may be able to put them back in place with no problem. If not, remove the bits of the old adhesive and use some rubber cement or silicone to reattach the pads. I used black RTV which seems to work well. Tape around the edges of the pads and let them dry. Well, there ya go. For a little bit of time and effort your flash is back in order! Can you post a link to where you bought the replacement bulb from? Having a hard time locating one. Great blog. Thanks for doing this. Sure. I purchased it from a website called US Camera. The URL for the bulb is: http://www.uscamera.com/fsa03601-xe701.htm I had it within 3 days of ordering. You can also find the bulbs on Ebay though shipping might take longer as all the sellers are overseas. Thanks for the comments! Glad you’re enjoying the site.